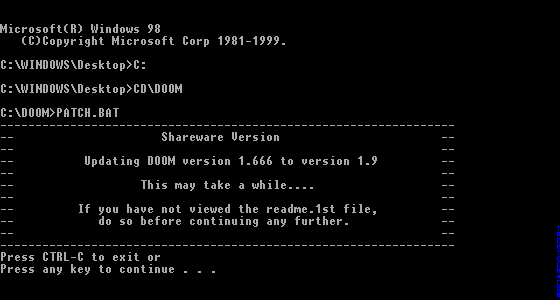 Patching Doom to v1.9 (Shareware) (Doom) - TACKtech Corp.
Download ZIP files to a folder. Open the ZIP using WinZip. and extract them into your Doom folder. Open the ZIP file in WinZip Classic Mode. Click the Extract button on the toolbar. Type in the path you install Doom to in the Extract to textbox. 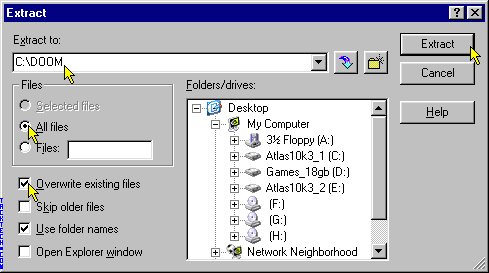 Select the All files option. Check the Overwrite existing files check box. Press any key when prompted.